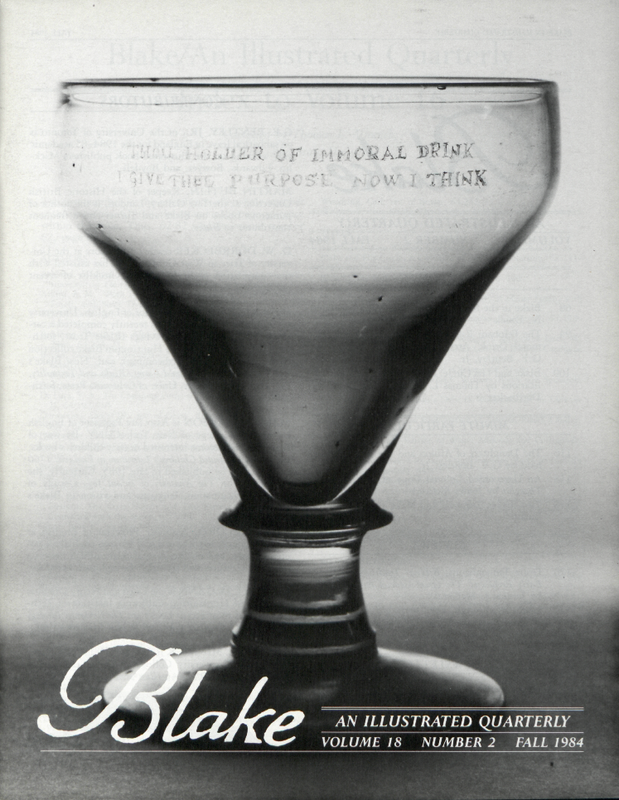 The Felpham Rummer: A New Angel and “Immoral Drink” Attributed to William Blake by G.E. Bentley, Jr. The Daughters of Albion and the Butts Household by G.E. Bentley, Jr.
G.E. BENTLEY, JR., of the University of Toronto is on sabbatical leave in England for the 1984-85 academic year working on the illustrated-book publishers Macklin, Edwards, Bowyer, and Boydell. MARTIN BUTLIN, Keeper of the Historic British Collection at the Tate Gallery, London, is the author of numerous books on Blake and Turner and a frequent contributor to Blake. D. W. DÖRRBECKER teaches art history at the University of Trier in West Germany and has assisted with the compilation of Blake’s annual checklist of recent publications since 1977. ROBERT N. ESSICK (Professor of English, University of California at Riverside) has recently completed a catalogue of Blake’s Job engravings (Blake Trust, forthcoming), a catalogue of the Huntington Blake collection (Huntington Library, forthcoming), and “How Blake’s Body Means” (for Unnam’d Forms: Blake and Textuality, eds. Hilton and Vogler, Univ. of California Press, forthcoming). MARY V. JACKSON is Associate Professor of English at the City College of New York-CUNY. By way of Blake, she has become interested in early children’s books; her study, Illustrated Children’s Literature in England: 1760 to 1840, will be published in late 1985. Currently, she is working on The Anatomy of Infant Joy, a study of memory, imagination, language and vision in Blake’s early poetry. JAMES McCORD, Associate Professor of English at Union College, has lectured and written on Blake’s poetry and art, and on the general relationships between history, literature, and art since the eighteenth century. JEROME J. McGANN is the Doris and Henry Dreyfuss Professor of Humanities, California Institute of Technology. His most recent books are The Romantic Ideology (1983) and A Critique of Modern Textual Criticism (1983). THOMAS L. MINNICK is Assistant Dean and College Secretary of University College at Ohio State and is Bibliographer of Blake/An Illustrated Quarterly. Editorial Assistants: Leslie Donovan, Chapel Petty, University of New Mexico. Subscriptions are $18 for institutions, $15 for individuals. All subscriptions are by the volume (1 year, 4 issues) and begin with the summer issue. Subscription payments received after the summer issue will be applied to the 4 issues of the current volume. Foreign addresses (except Canada and Mexico) require a $3 per volume postal surcharge for surface mail, a $10 per volume surcharge for air mail delivery. U.S. currency or international money order necessary. Make checks payable to Blake/ An Illustrated Quarterly. Address all subscription orders and related communications to Robin Tawney, Blake, Department of English, University of New Mexico, Albuquerque, NM 87131, USA. International Standard Serial Number: 0006-453x. Blake/ An Illustrated Quarterly is indexed in the Modern Language Associations International Bibliography, the Modern Humanities Research Association’s Annual Bibliography of English Language and Literature, English Language Notes’ annual Romantic Bibliography, ART bibliographies MODERN, American Humanities Index, and the Arts and Humanities Citation Index.